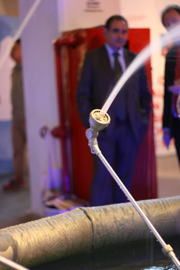 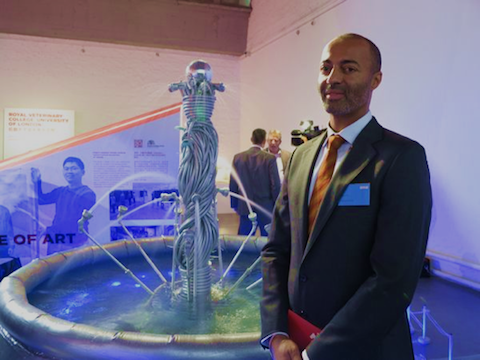 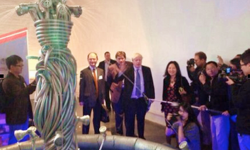 The fountain was opened by the Mayor of London, Boris Johnson, as part of his first official visit to China in 2013. 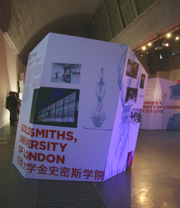 This ambitious large scale installation was commissioned by Goldsmiths, University of London to highlight London and Goldsmith's cutting edge creativity. 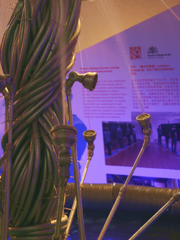 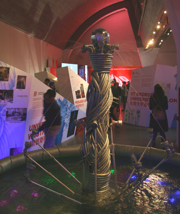 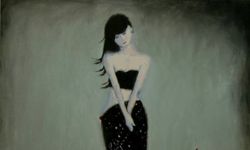 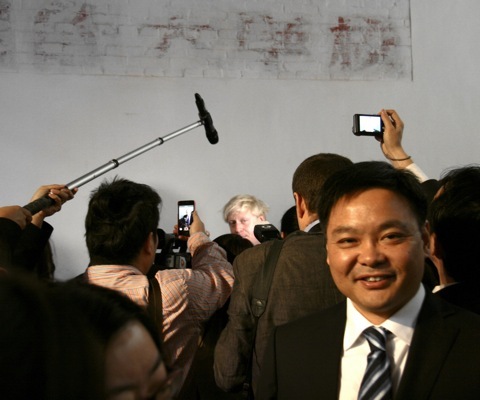 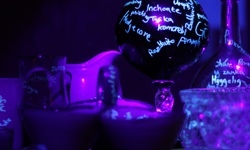 It was the centre piece of the exhibition London: Celebrating Innovation in Beijing. 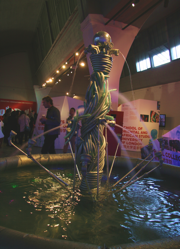 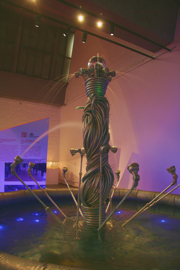 Water in the fountain reacts directly to live sound collected and transferred from around London and Goldsmiths. 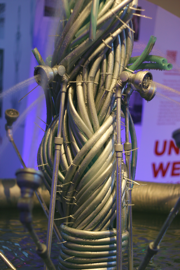 This hi-tech fountain is entirely made from humble domestic British garden hosepipes and watering equipment. 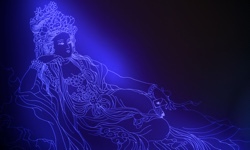 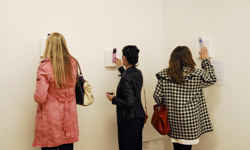 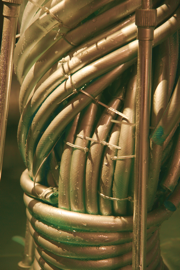 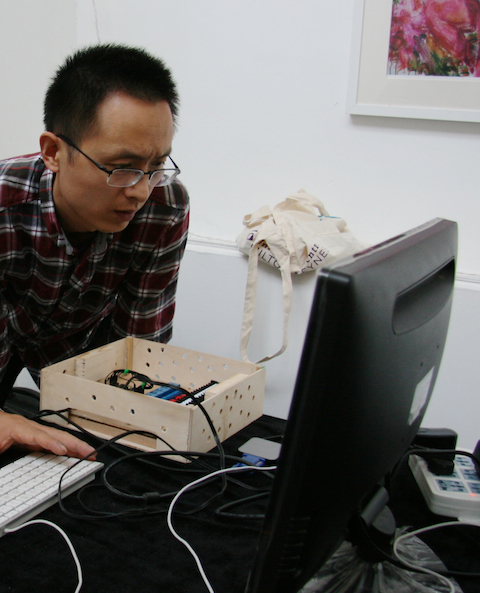 Sounds were collected from places such as Westminster, Soho, Chinatown and workshops in Goldsmiths. 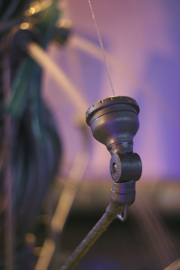 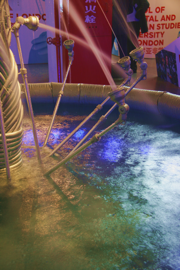 It was then processed by our specially engineered software, processed in the cloud and finally converted into signals that control each individual water pump in the fountain. 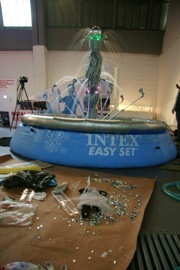 Although the concept came from London, all materials used for the fountain were locally sourced to promote sustainability. 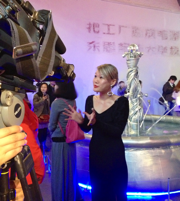 This also reflects on our current consumer culture where design is elsewhere but all the rest is Made in China. 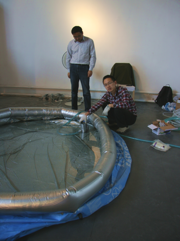 Aowen Jin and two electrical experts had a very tight schedule and used only two days to complete the large scale installation. 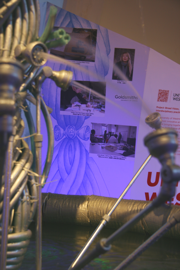 "What you see here is not just an artwork, but my love, passion and utmost gratitude to the City of London and Goldsmiths University. 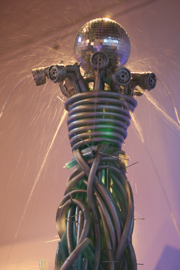 Both have offered me so much opportunity and respect as an artist." 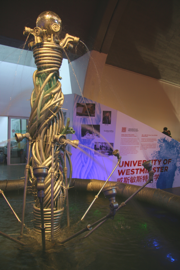 "Audiences in Beijing can watch how water dances in the fountain and marvel at the diverse and vibrant activities happening in London and Goldsmiths at that particular moment." 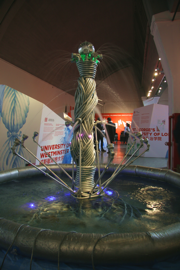 "With cutting edge technology, the fountain was designed to truly showcase the dynamic excitement of London and Goldsmiths." 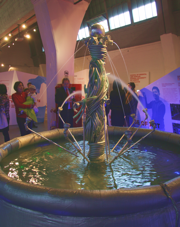 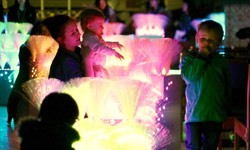 "By transferring the energy from sound into water, the fountain connects the two cities (London and Beijing) together." 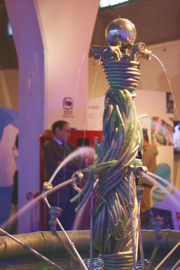 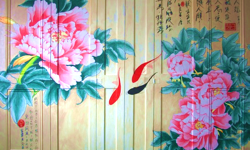 "As much as showcasing the innovation of London, the artwork also attempts to highlight a beloved British tradition - gardening - which is a culture very foreign to a Chinese audience." 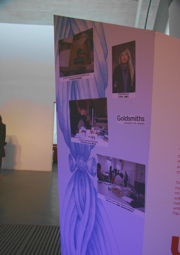 The wonderful people who made the project happen. 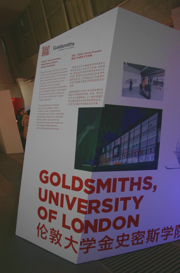 Geraint Fox, Head of the International Office, commissioned the project for Goldsmiths, University of London. 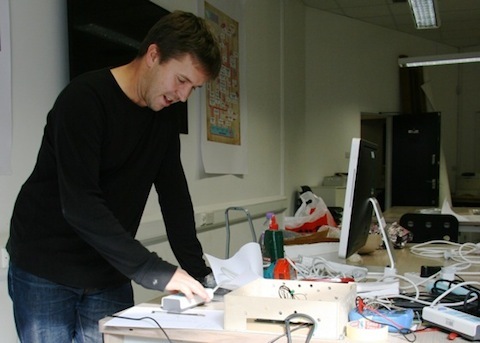 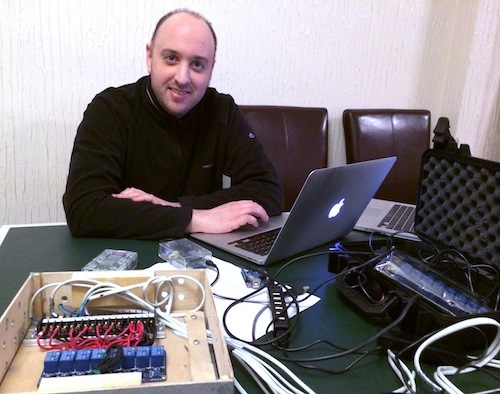 Jamie Brown wrote the audio processing code that ran on several Raspberry Pi PCs, and managed the cloud-based transfer of audio from London to China. 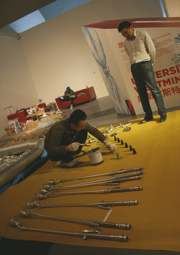 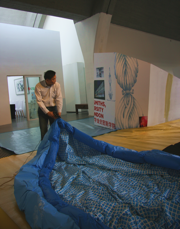 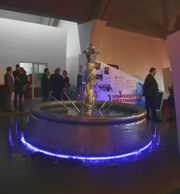 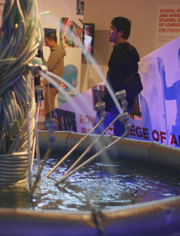 Xiao Zhao, of Changzhou College of Information Technology, helped procure equipment for the fountain in China, and helped to assemble it in the gallery. 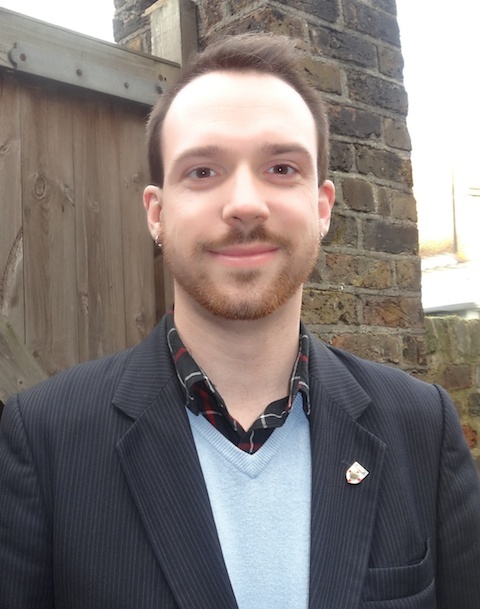 Jim Faherty is International Officer at Goldsmiths, University of London, and organised the project and its stakeholders. 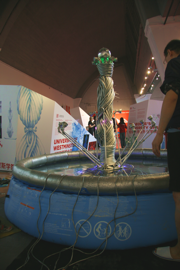 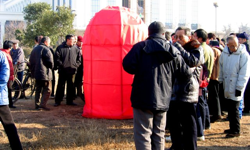 Haikong Lu, tutor at Changzhou College of Information Technology, provided technical support on-site and helped assemble the fountain in Beijing. 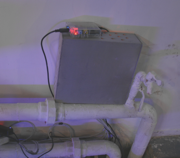 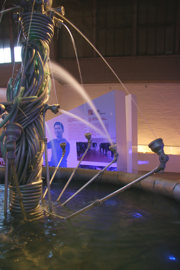 Peter Rogers created the electronics and configured the Arduino-based relays that powered the fountain based on the low voltage audio signals.